If a patient has very few remaining teeth, or if the remaining teeth are poorly distributed in the arch or are very weak and not expected to last very long, the Cu-Sil® partial is an excellent option. It is made very much like a complete denture, except that holes are created for the remaining teeth and silicone gaskets are placed in the holes to help the denture hug the tooth and to preserve the suction of the appliance. See photographs below on the right. Where other partial dentures have clasps on the teeth to hold them in place, the Cu-Sil gets its support from the soft tissue. Thus there is very little stress on the teeth that are left, which helps prolong their life. 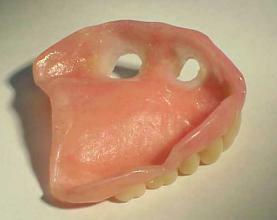 The esthetics are also better than a removable partial, because of the lack of clasps. As compared to a complete denture, it is more secure and moves around less because it is somewhat stabilized by the remaining teeth. The presence of remaining teeth also prevents bone resorption around those teeth. The dental lab has to purchase a license from Cu-Sil in order to be allowed to make this partial, and not every state has a licensed lab. But there are no special skills to making this appliance. 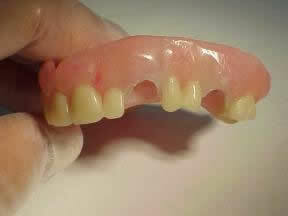 Any dentist who has learned techniques for making a complete denture would be able to make one, and then it would be a matter of simply checking the Cu-Sil website at www.cu-sil.com and finding a licensed dental lab.